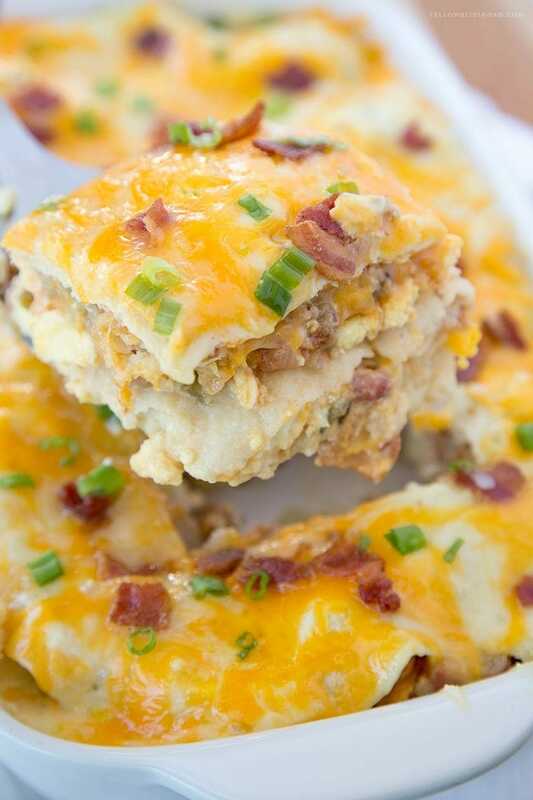 This Breakfast Enchilada Casserole is super creamy, a little spicy and just all around delicious! 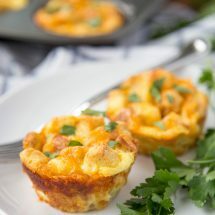 It’s perfect for any meal of the day, from breakfast to dinner, and requires very little effort (which is my favorite thing!). 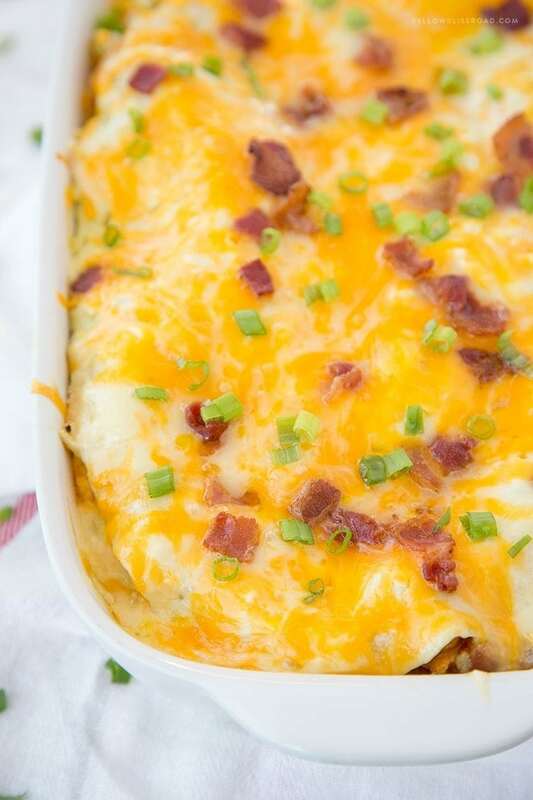 One of our favorite meals of all time is this Chicken Enchilada Casserole. I thought it would be fun to do a play on that recipe, but for breakfast. As luck would have it, this Breakfast Enchilada Casserole turned out even more amazing than I expected. 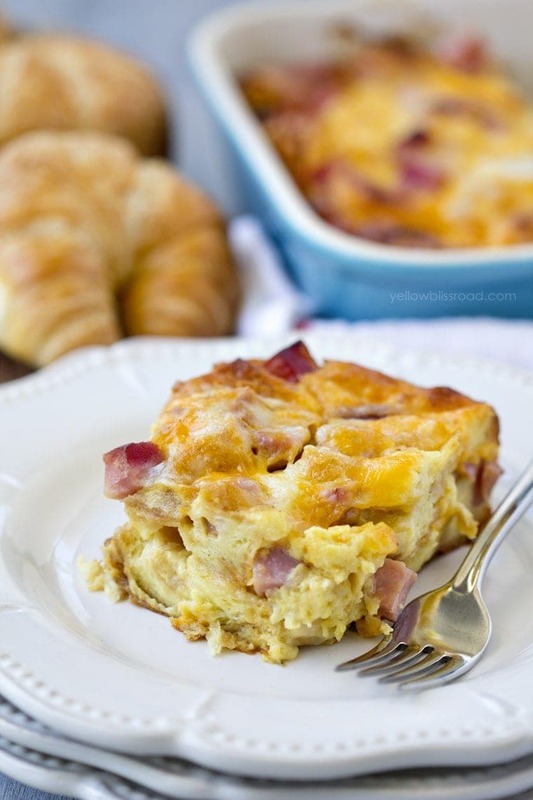 The layer method is the same and the flavors are very similar, only instead of chicken, you’re using scrambled eggs, bacon and sausage! 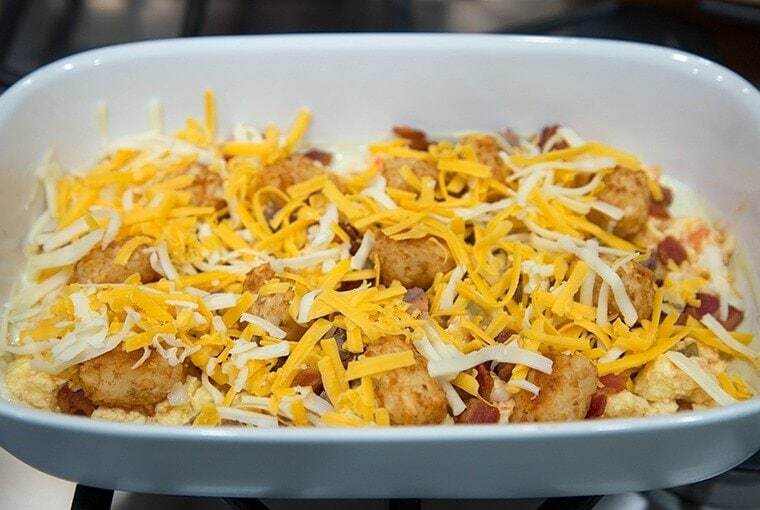 I added some tater tots too, because what’s a breakfast casserole without tater tots? Of course there’s lots of cheese, and a creamy green chile enchilada sauce to top it off. It sounds like a lot of steps, but they are really, really easy steps. First cook the elements of the casserole: Scrambled eggs with salsa, bacon, sausage, tater tots. Combine the green chile enchilada sauce with some sour cream. 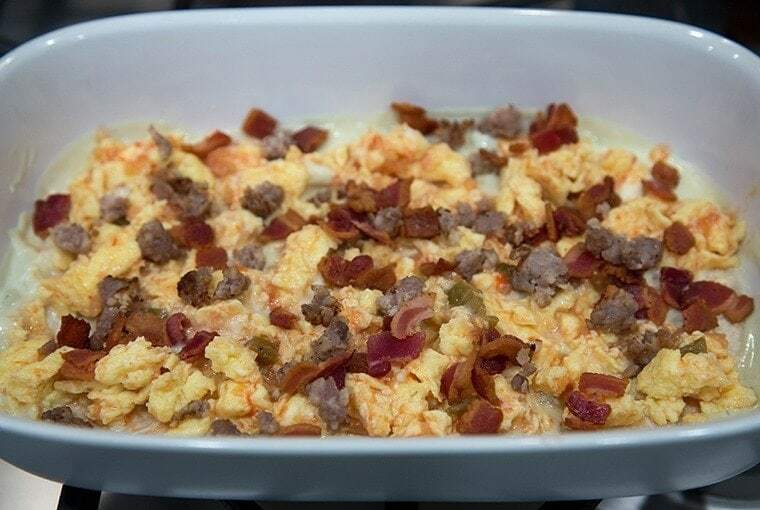 Then layer it all together like this: Creamy green chile enchilada sauce, tortillas (broken to fit the casserole dish), scrambled eggs mixed with salsa, bacon, sausage, tater tots, cheese. Repeat. 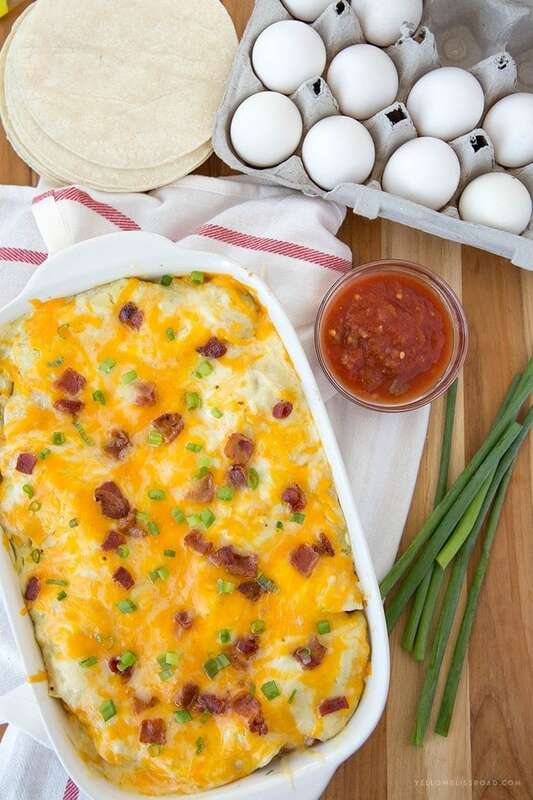 This Breakfast Enchilada Casserole is sure to be the star of your next meal, no matter whether that’s brunch or dinner. Whisk together eggs, milk and salt. Cook in a buttered skillet on medium heat, stirring often, until eggs are cooked through (not browned). Stir in 1 cup salsa. Set aside. Stir together green chile enchilada sauce and 1/2 cup sour cream. Set aside. In an 11"x7" or 13"x9" baking dish, pour a thin layer of the enchilada/sour cream sauce. 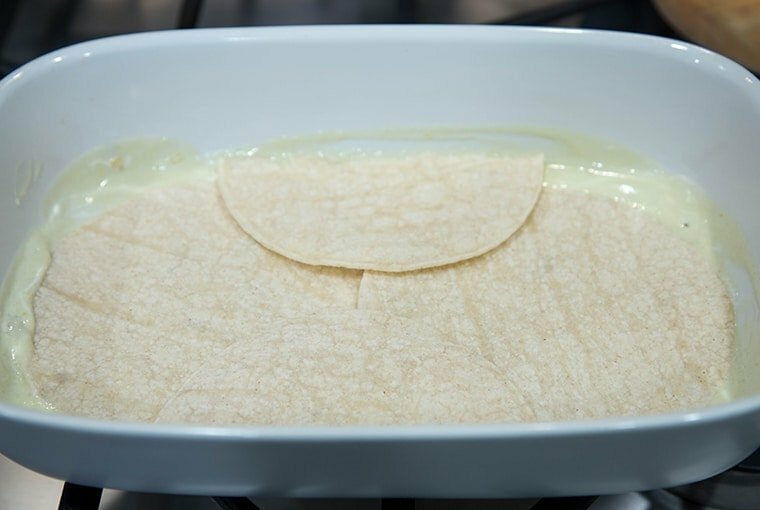 Layer with tortillas, breaking to fit as necessary to form a single layer. Spoon a third of the egg mixture over the tortillas, then a third of the bacon, sausage, and tater tots, a third of the shredded cheese and a third of the remaining enchilada sauce. Repeat with two more layers, finishing with a layer of tortillas, then sauce, then cheese. Top with reserved crumbled bacon, if desired. Cover baking dish with nonstick foil. 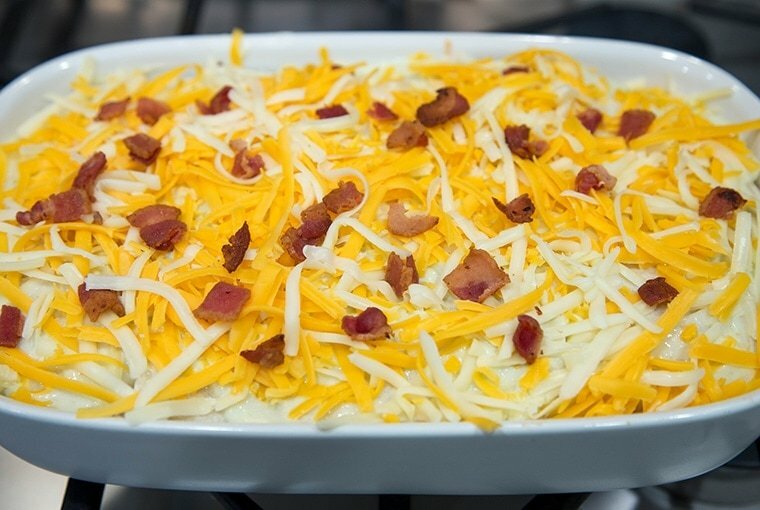 If you don't have nonstick foil, stick several toothpicks into the casserole to keep the foil from touching the cheese. 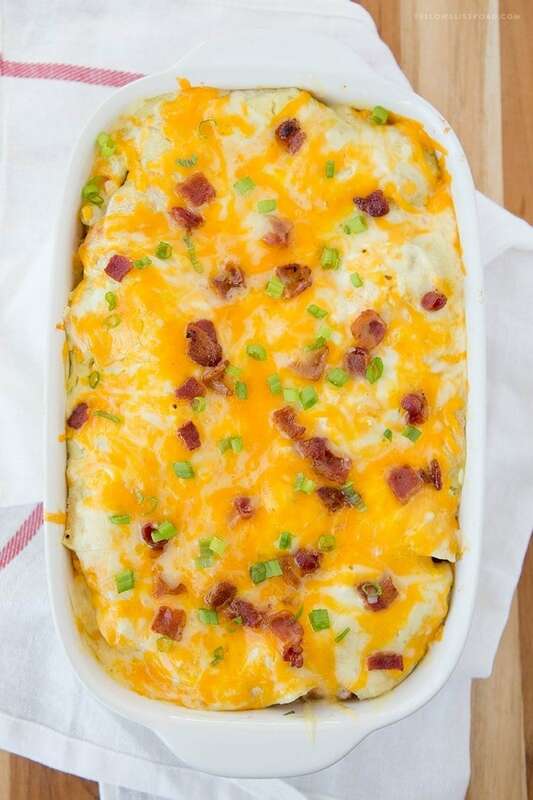 Casserole can be kept in the refrigerator for up to 2 days or frozen for up to 1 month before baking. Bake, covered, for about 40 minutes in a pre-heated 350 degree oven. Remove foil and bake 10 minutes more, or until cheese is completely melted. 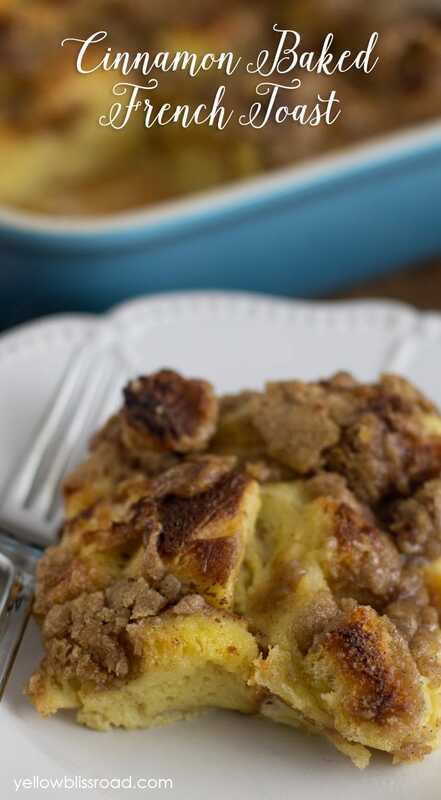 For all breakfast recipes go HERE, for all main course recipes, go HERE and for the recipe index, go HERE. 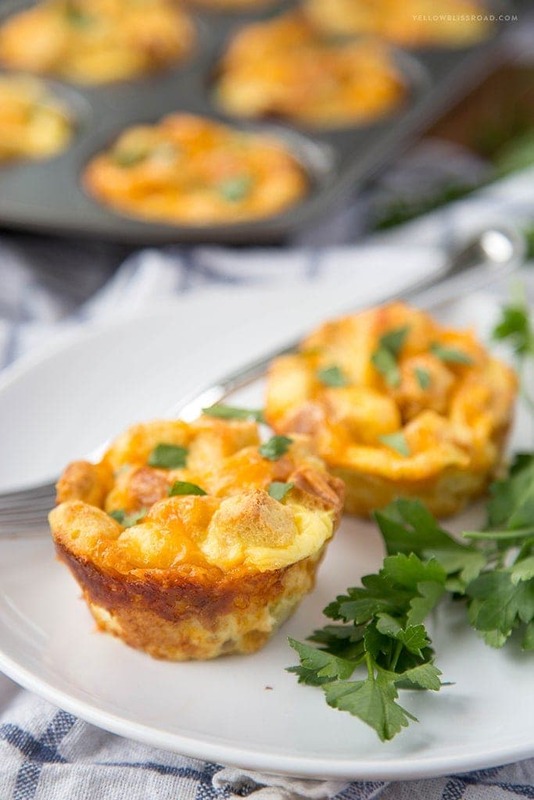 How did you do this casserole in muffin cups as shown in picture?